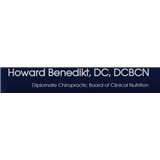 Howard Benedikt, DC, DCBCN (New York) - Book Appointment Online! Dr. Denedikt was great. He saw me right away, and really listened to what was going on. He had a ton of knowledge and immediately helped me to alleviate my back pain.